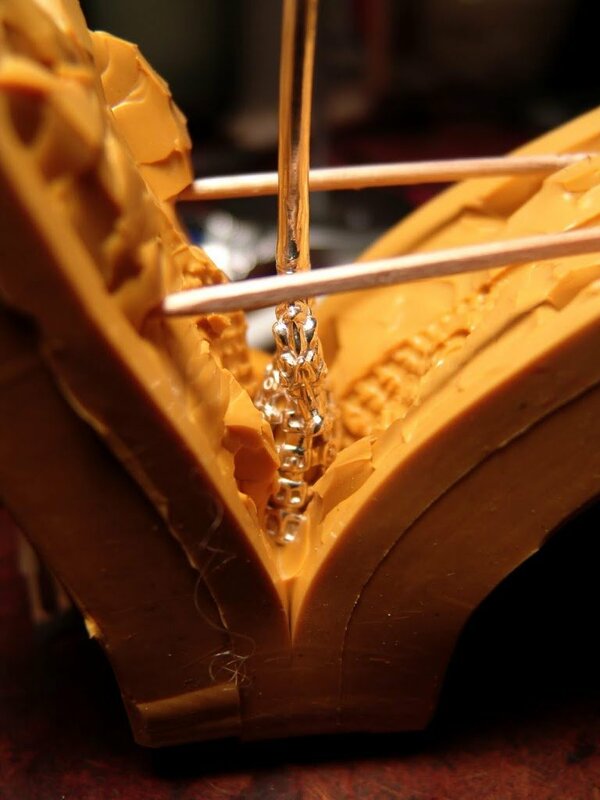 As part of the studio’s presentation I demonstrate wax injection, one part of the process of the bells’ manufacture which I am capable, within the constraints of time, to demonstrate simply. 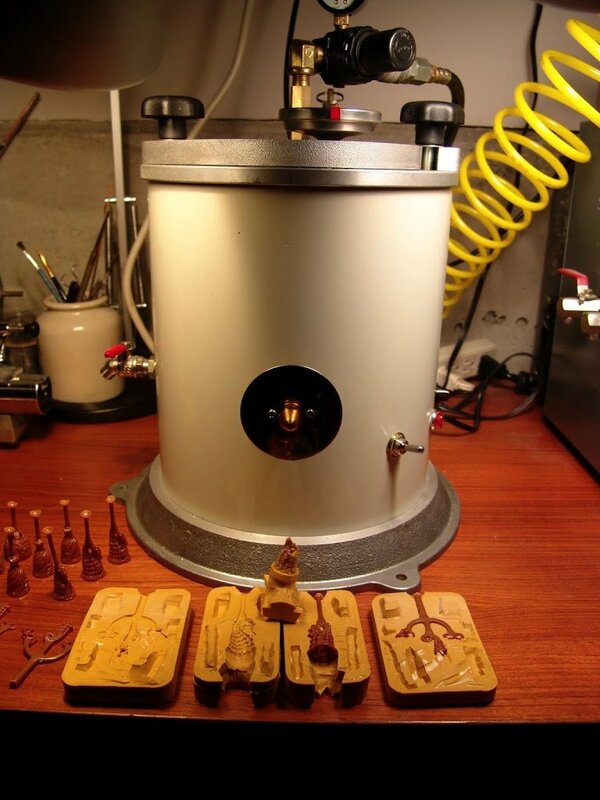 I am thus encouraged to explain here the process of making the mold into which the wax is injected. 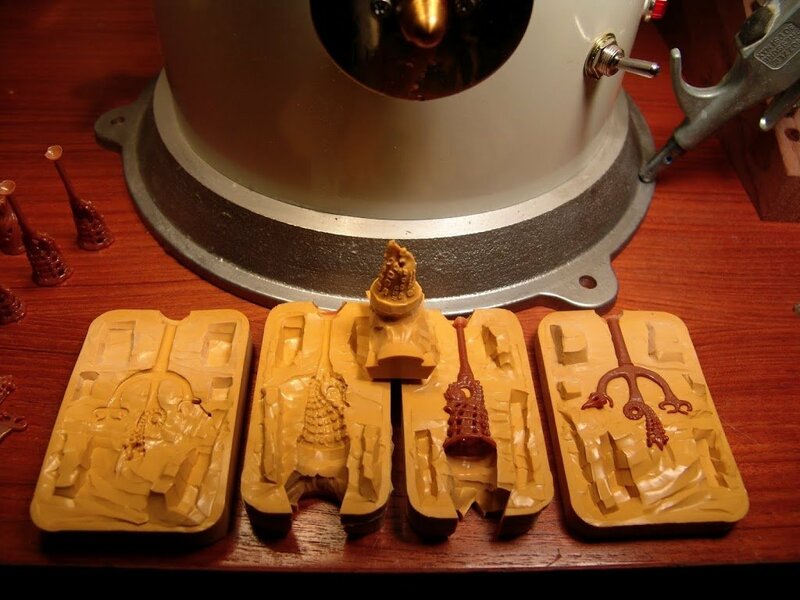 Here are the castings made from my original wax carvings for several designs plus their clappers. I call these the “masters” & I securely archive them in order to be able to remake any of the rubber molds which might break or wear out. 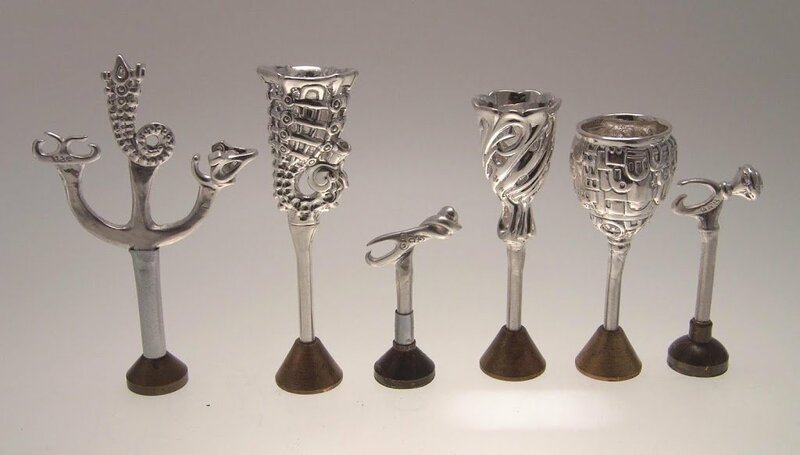 They are also the best form of copyright, since the molding process will shrink the design slightly & all bells made from them will be smaller. 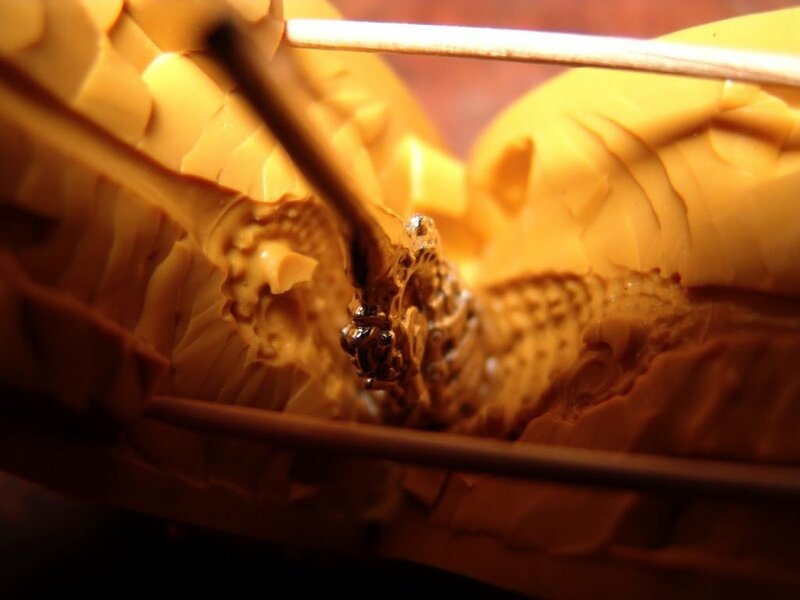 You see them sitting upside down on their “sprues”, which are the rods which were the channels through which the molten metal entered the temporary plaster mold to make the casting. A bell has at least two pieces — and the clappers must be made separately, of course. This is the raw silicone rubber, which is soft & resembles a dense putty. It comes in strips protected with peel-able plastic on both sides. I cut it to size with scissors & pack it around the master in an aluminum mold frame, with the sprue touching its interior side. At this stage I must begin to think “inside-out” as I work to fill the negative space around the bell with the positive rubber. 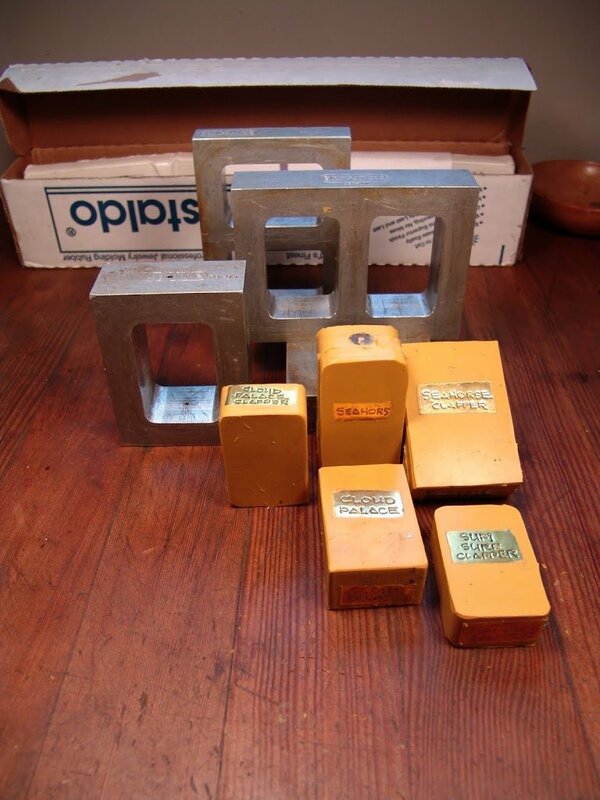 When the mold is filled I label it with a thin aluminum or brass tag into which I emboss its name with a stylus. 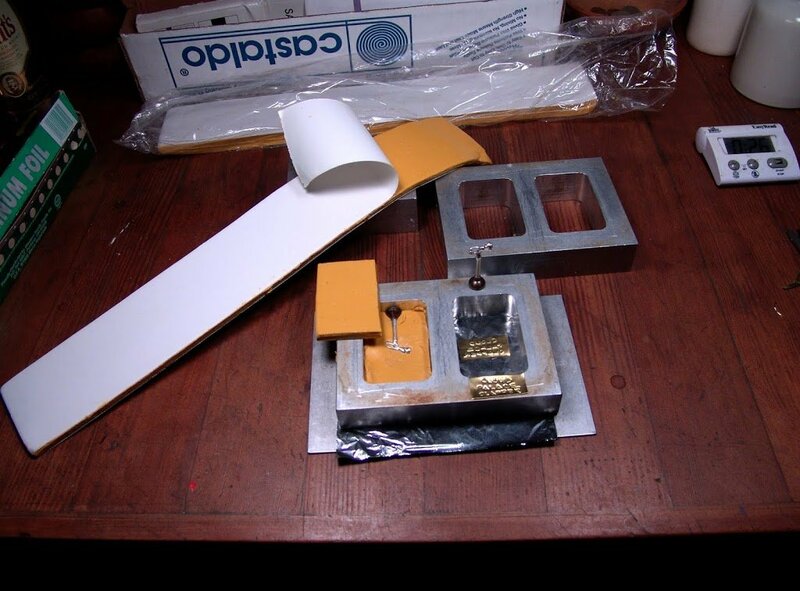 The mold press has two electrically heated platens between which the mold is sandwiched. A heavy screw with a large handle tightens to press it all tight. vulcanizes the rubber in about an hour. 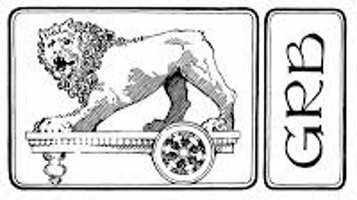 The result is a solid block of harder rubber completely enclosing the master, squeezing a slight excess, which insures that all the details of the master have been captured. It shrinks a bit as it cools, freeing itself from the sides of the mold’s interior. 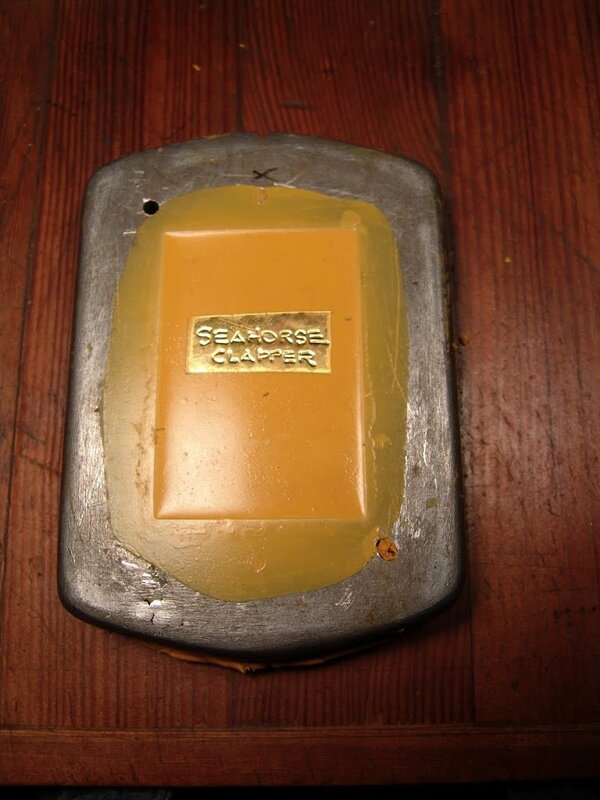 leaving the name permanently as part of the mold. Next comes the difficult part! 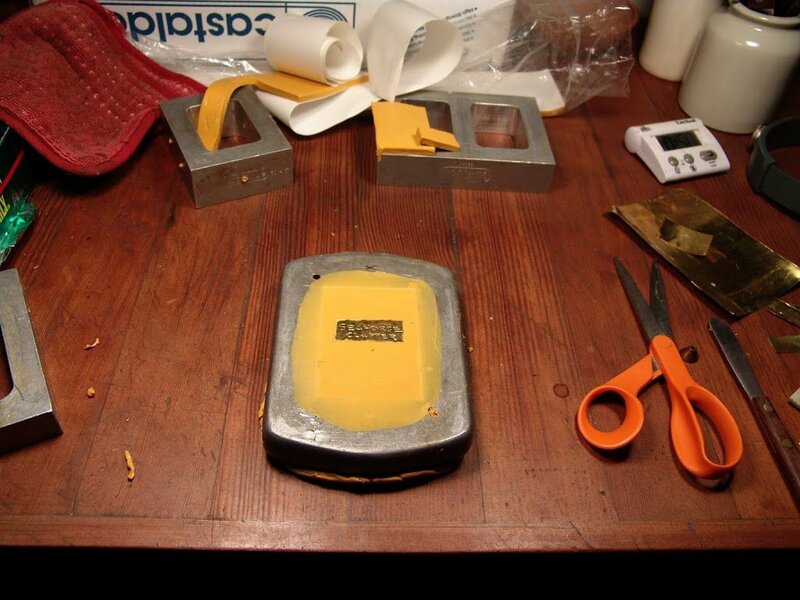 I use a scalpel to very carefully cut the block apart to free the master, while also making “keys” to secure the fit when the mold is put back together. It is fascinatingly puzzling to dance between thinking positively about the negative! 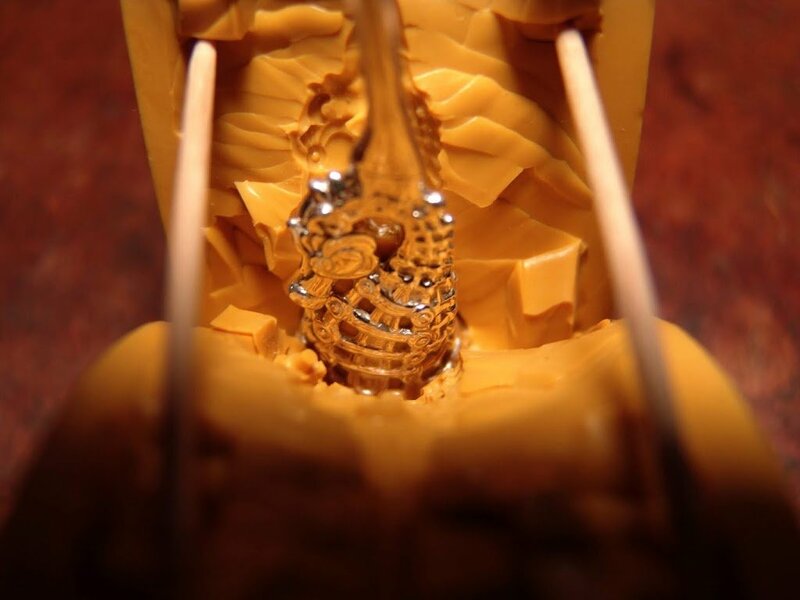 It requires bringing the cuts from the bottom of the sprue ever closer to the still invisible master, prying the dense rubber apart with the help of a hook mounted to my desk. 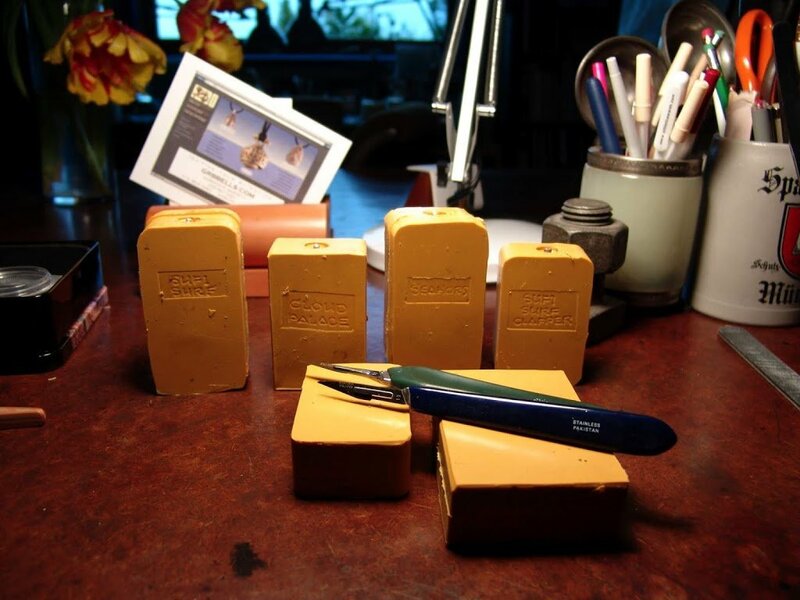 It is important to land the cut at the best place on the design to make the mold function well, both to promote the escape of air pushed ahead of the molten wax & for ease of removing the cooled wax. 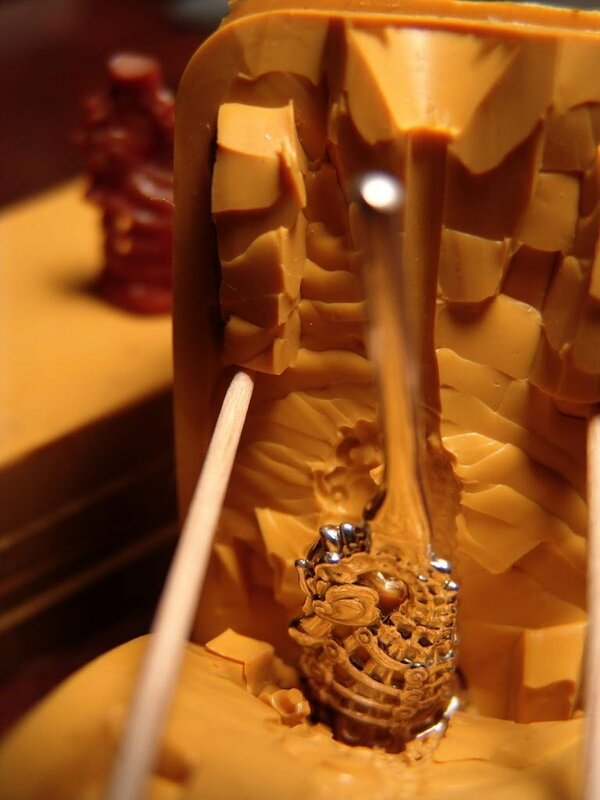 These photos show the process arrested by being held open with toothpicks… Each piercing in the design must be cut cleanly so as to efficiently re-close, recreating that detail in wax. I cut down from around the skirt of the bell to create a core which is pulled from the interior of the master, with another tricky part involving the clapper loop which clings, being filled with rubber in the top of the bell’s interior, difficult to reach with the blade. Even with a collection of tricks over years of experience, I often still struggle with this part of the process! Below you can see that core sitting-up in the center, atop the left & right half of the mold, which shows the positive wax which was injected into it. 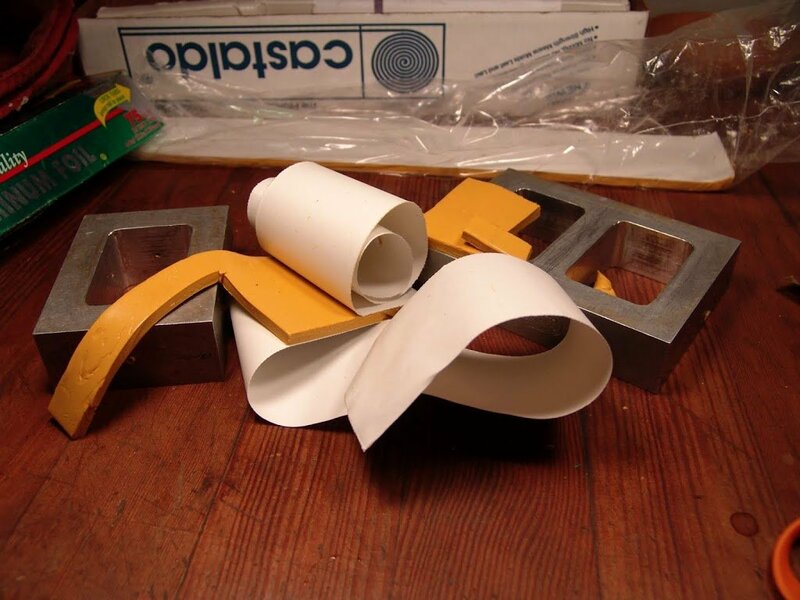 Outside are the halves of the second mold containing the 3 clapper parts. 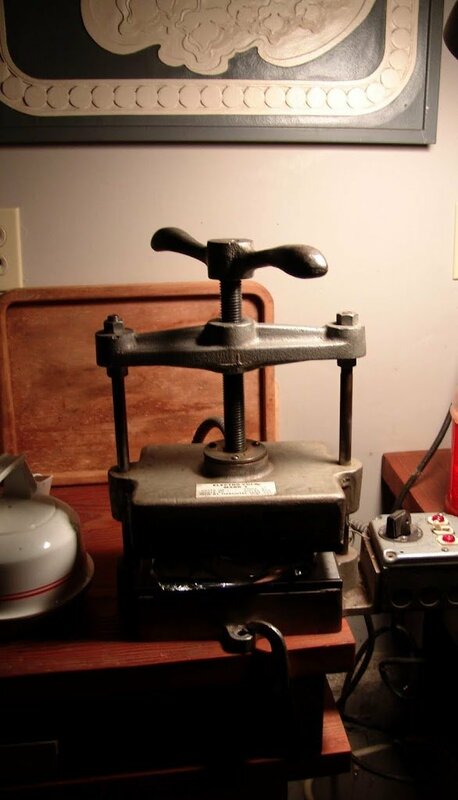 The wax injector is a heated pot filled with wax under about 5 pounds of air pressure. 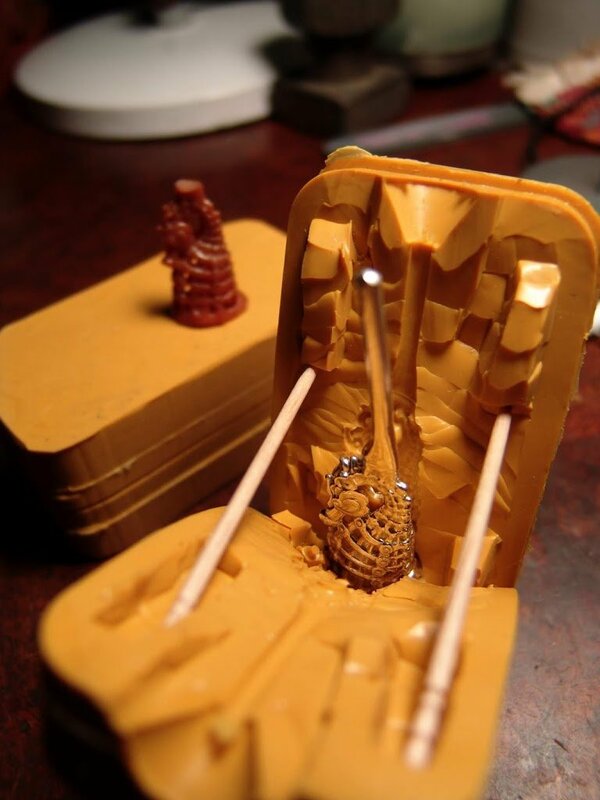 Near-liquid molten wax is injected into the sprue of the mold when pressed against its nozzle, thus engaging the pressure sensitive valve behind it. 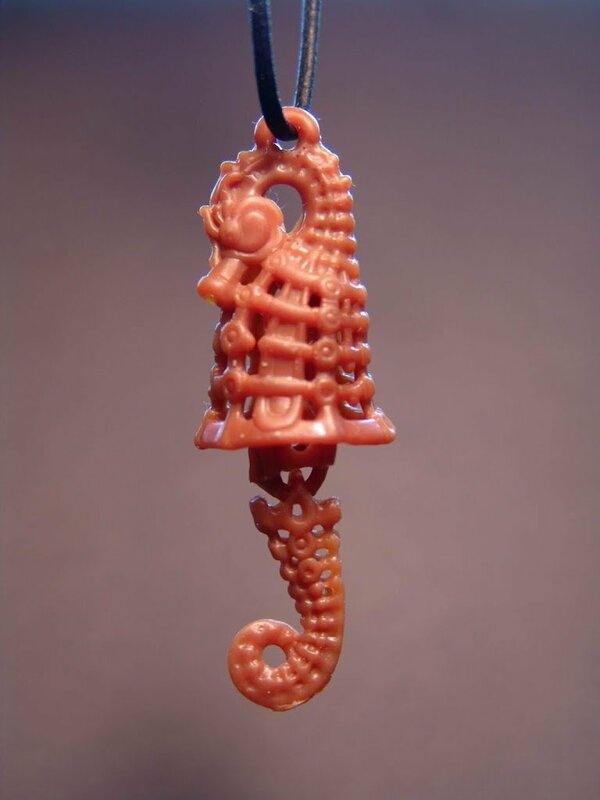 The result is a wax replication ready to be cast into metal to make the bell I will sell.